MondoTalk offers two distinct modes of service, business and residential. Under business, the provider sells and loans phones, as well as offers a Cloud PBX service. In doing so, the provider offers a variety of standard VoIP features such as Virtual Phone Numbers, Multi Location, Multi Business, Automated Receptionist, Voicemail Email, Call Transfer, and many more. Aside from feature, the business solution is scalable for both small and large businesses. There are also no contracts. Extensions and lines are unlimited with no extra costs. Customized solutions are available, too. Pricing depends on plans—which are broken down for Australia and New Zealand plans, and US and Canada plans. 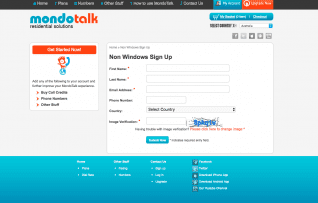 With Residential use, MondoTalk offers dial plans via monthly and/or prepaid options. Additionally, they offer extras such as Call Features (E911, Voicemail, Call Forward, Virtual Number, Party Call, etc. ), bundles, and easy numbers (different numbers to purchase). Each of these is subject to additional, individual pricing. Dial Rates are also available—which help improve cost efficiency. Customers can create a free account, too. Pricing is again based on the plan(s) and feature(s) selected. In terms of customer support, there are a number of resources available. With Residential users, there are videos, manuals, and downloads, as well as a direct contact form. For Business users, support can be reached via phone, email, contact form, as well as via web portal. What Do You Think of MondoTalk?